Losing the baby was hard. Letting go of the vision was even more painful. Flashback to 1997 when our nine year marriage, on the brink of divorce, was rescued from the miry pit as two lost sinners surrendered their lives to Jesus Christ. The very first issue the Lord addressed after coming to salvation was our heart attitude toward children. Children are expensive, intrusive, and messy. Five was enough! Cesarean is a major surgery and multiple repeat c-sections are risky. 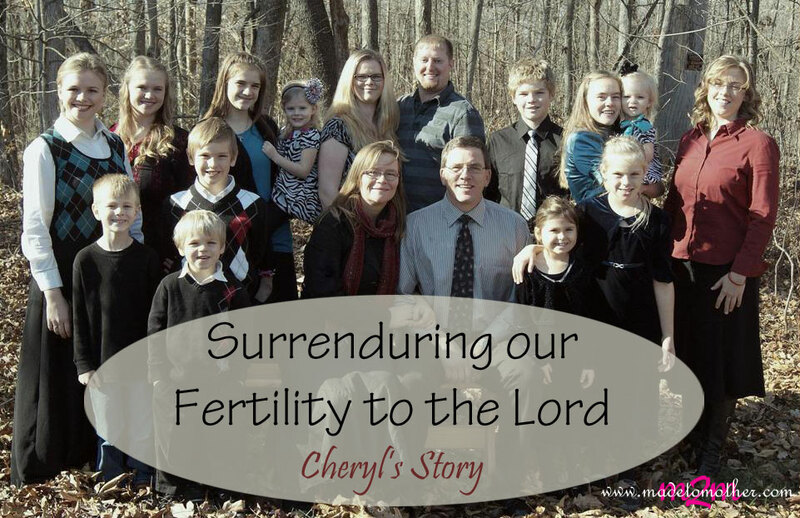 My Husband, Terry and I were faced with the challenge of surrendering our fertility to the Lord. I remember my exact words as I stood there four months pregnant, looking at my husband with fear and doubt in my heart. “We could end up with ten kids!” But the heaviness outweighed the fear and we knew the Lord wanted our heart obedience. We held hands as Terry prayed, telling the Lord we were willing to allow Him to determine our family size. We relinquished all rights to our fertility. Oh my, how the Lord abundantly blessed this step of obedience! I witnessed my heavenly Father perform a miracle when He used an unsaved, crusty old obstetrician to get us to consider a VBAC (vaginal birth after cesarean). By the time we arrived at d-day on August 7, though the doctor had changed his mind (after being chastised by several of his colleagues who’d uncovered our scheme), we were confident that we were walking in God’s perfect plan. While my husband and the doctor fought over the use of forceps, Baby MacKenzie began to make her grand appearance. I went down in the medical books in Indiana as the first woman to deliver a VBAC after four cesareans! And God received all the glory! Two years later, I delivered a 10 lb 4 oz baby girl in a different hospital with a midwife. Not so pleased with the details of this birth, the next two babies, Isaac and Sam were born in a free-standing birthing center with midwives. Our ninth child, a whopping 11 lb 15 oz baby girl, was born on our kitchen floor. The homebirth was planned. The size of the baby however, was not. Our babies had been coming every 17 to 24 months since we had surrendered our family size decision to the Lord. During those years, that commitment had been tested and reevaluated numerous times, but we never wavered in our resolution to entrust our fertility to our faithful heavenly Father. It came as no surprise when I discovered that I was pregnant again in the fall of 2006. Our home erupted in cheers and shouts of joy when we announced there would be a new baby to love in the spring. I had previously experienced pregnancy loss three times before salvation. But somehow losing this baby was different. I did not “bounce back” as quickly as I had before. After going through the usual shock and grief, something foreign began to settle into my spirit. At first I couldn’t put my finger on it, but an icy chill seemed to surround my heart and I felt isolated and distant from the Lord. One morning as I began pouring out my heart to Jesus, the pain bubbled to the surface and the root of the problem was revealed: I was angry at God. We had done all that He had asked of us. We had been obedient in surrendering our fertility. Even against the advice of other well-meaning Christians and amidst the condemnation from family members, we had not only been willing, but eager, to have as many babies as the Lord wanted to send us. Why then was He suddenly taking them back? It stung like a slap in the face and I felt betrayed. Perhaps it was us. Could it be that Terry and I weren’t meeting the parenting expectations that God had set for us? The house seemed a perpetual wreck, homeschooling didn’t always flow, and at times I felt pulled in too many directions. Maybe the Lord had determined that we weren’t faithful after all in training up Godly sons and daughters for His glory. These thoughts proved to be toxic. I was a mess. Through the haze of depression, I decided to focus my thoughts on the original covenant we had made with our heavenly Father back in 1997. To give up all rights to our fertility. Part of that agreement included “having as many babies as He would send us,” as well as training up sons and daughters in the nurture and admonition of the Lord. But was this all we had agreed to or was there more to it than that? The answer was revealed in Romans 12:1: “…present your bodies a living sacrifice, holy, acceptable unto God, which is your reasonable service.” In giving our fertility to the Lord, we had in fact presented our bodies as “living sacrifices” to Him. As His children, who were we to tell our omnipotent and omniscient God what He should or shouldn’t do with the sacrifice we had presented to Him? That really wasn’t our business. We weren’t merely “collecting children” but surrendering ourselves to the Lord. I could find peace in that. And then I began to consider the baby. Our baby. What purpose did this child’s short life serve? I thought about where the baby was now. Paul said to be absent from the body was to be present with the Lord. Could it be that there was one more soul around the Throne of God, worshiping the Lord because of our willingness to obey our heavenly father in giving up our rights to our fertility? Surely that was purpose enough! Since that loss seven years ago, the Lord added a tenth baby to our home, through birth. And another child through different circumstances, who was born in 2007, the same year the baby of this story was due. There have also been three additional pregnancy losses, though I no longer view them as “lost” anymore. 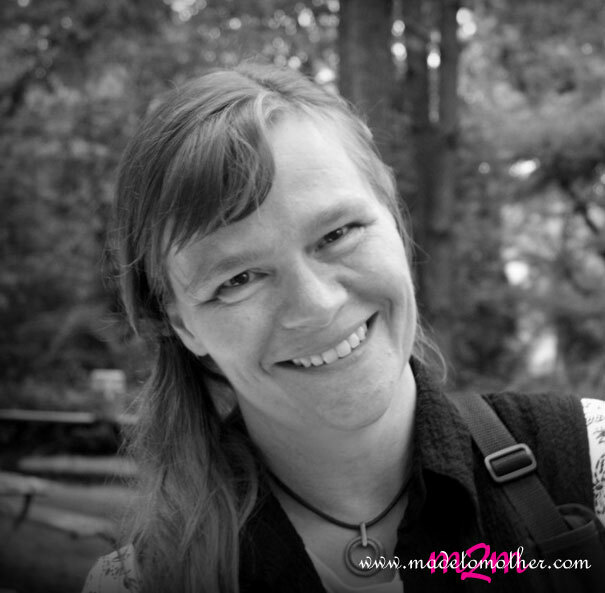 Her passions include writing and ministering to women, which mesh perfectly on her blog Treasures from a Shoebox. She also recently began a family blog with five of her daughters called The Long Way to Go, a fun site for moms and daughters which focuses on topics such as courtship, purity, and preparing for marriage, as well as mentoring and mothering. I can completely identify with your feelings. My husband and I gave control of my womb and our fertility to God in 2010 after having three boys. Noel was full-term stillborn in April 2011; I miscarried Natalie and Isaiah in 2012 and 2013. It was a long, hard road filled with much doubt and emptiness. Praise God in April 2014 I delivered baby Logan and baby Moriah is due this September! It is a hard road to travel, but I have learned His grace truly is sufficient! Wow Alyssa, that’s quite a bit of grief to process in a short amount of time. I trust the Lord has used your pain to draw you deeper into a love relationship with Himself, as you have found His merciful grace sufficient. Do you find that commitment tested with not only every loss, but every birth as well? I must be honest, there were times when I was tempted to take things into my own hands. Thankfully, it was during those times of testing when the Lord revealed His faithfulness and helped me to trust Him wholly. Beautiful story! I love how you surrendered your fertility to God. I have never heard that being done before but your story is one of how God has used you and your husband for His good through your children. Thank you for sharing this at The Weekend Brew. Thank you, Mary. We would probably have never heard of it either if we hadn’t gone to that seminar, just two weeks after I was saved! It truly was the very first issue the Lord focused on in our hearts. And with good reason, considering how I had attempted to cut off children before we had gotten to that point. I look back at all of that now and marvel at how the Lord protected my womb…from myself! Wow, what a powerful testimony! Stopping by from #SmallWonders today! Thank you Karrilee for your encouraging words and for reading my story! Thank you for sharing this honest and inspiring testimony. Praise God that your baby is now with Jesus, and that you will meet that precious soul and live together for all eternity! linked up with you at UNITE — hope you’ll stop by Saved by Grace for a visit! Thank you for your kind words Laurie. I have 7 tiny “treasures in heaven” waiting to greet me some day! I did pop in over at your blog and read your testimony of Salvation (one of my favorite subjects!). It is beautiful how the Lord allowed those seeds to be sown in your life for your good and His glory and how He brought them to fruition. Oh Hazel, I’m so sorry for your loss, but I am thankful your family could clearly see the Lord in the midst of the pain. His comforting presence is so real during those times. Thanks for taking the time to comment. Wow, VBAC after 4 C-sections! I’m sorry to hear about your miscarriages, we’ve experienced that too and it’s not easy. Yeah; VBAC after 4 cesareans is pretty rare and has amazed (and horrified!) some doctors I’ve seen through the years. I truly believe the Lord healed that scar as we made this covenant with Him. Considering the size of our babies, everything defies logic. Thanks for reading my story! Thank you for sharing this, Cheryl! I’m a somewhat new Christian (2yrs) and I am REALLY struggling with this issue. God has been so generous to us even before surrendering to Him. We have 2 boys and 2 girls – the last being a csection. My husband and I agree on no hormones nor surgical sterilization – however, we are currently using another form of contraception and it is taking away from our marital life. Cindy, there was a time (after the birth of our 7th child; our first son) when i was overwhelmed with children, my ill health, homeschooling; all of it, and I thought I was pregnant. I cried for three days (till I discovered I was not expecting). That’s when I realized that though we were doing nothing to prevent pregnancy, I was not open to babies in my heart. I confessed this to the Lord and asked this one request of Him: “If you want us to have more babies, change my heart, Lord.” He did and we did. He understands our hesitation and our fears. Take them to Him! Ask Him to change you and when He does, you will marvel at the work He has done in your heart. He gets the glory and you are drawn more deeply into a love relationship with your Savior. There is nothing to lose in asking! I did pray for you (and asked the Lord to give me the words to speak directly to your heart). God bless you as you seek to follow Him without reservation and put your trust in Him completely. Oh Amber, your words have brought tears to my eyes. To continue to trust…to be willing to “get back in the ring” in the wake of so much loss, that is the kind of faith that confounds the world. This is the other side of what surrender looks like. Allowing Him to have His way with us no matter the outcome. He is the potter; I am the clay. “Have Thine own way, Lord” is more than a beautiful hymn of consecration to be sung during Sunday morning service; it is the way of complete surrender. You have blessed me today, as I’m sure you’ve blessed the Father’s heart as well. P.S. Today is my daughter’s “golden” birthday as well. Happy birthday and may you be blessed. What an amazing testimony. I read recently that lots of times we want a testimony without the “test.” Thank you for sharing yours and your beautiful family. Ooo, I like that; no testimony without the “test”. So true! Thanks for reading! I needed to read this today. I’ve been vacillating over sterilization (we have six girls) but I just don’t want to go there in all reality. Your words have made me think. I have more praying to do! Thank you. I’m stopping by from House to Home. You know, looking back I marvel at how the Lord protected and preserved my womb in spite of me! I would have gotten sterilized during on those 3 three cesareans (conveniently so! ), except the doctors only delivered at one hospital, which happened to be a Catholic hospital that did not allow sterilization surgeries. I can tell you that you won’t regret following after the Lord! Thanks for stopping by. That must’ve been really scary and really difficult! I applaud you for your bravery in surrendering your fertility to the Lord. And bringing every baby into this world with joy. I confess I didn’t view my pregnancies the same way and I was steril after my third one. But God has given me grace and redeemed these moments. I was encouraged by reading your post, glad I stopped by from the Creative K Kids link up. I didn’t really have a positive view of my earlier pregnancies, I must admit. Aches and pains and inconvenience, plus the surgeries at the end made me not want to have very many. The Lord’s grace and mercy are everlasting and He does have a way of using all things for our good and His glory. I’m glad you were encouraged. Hello there Cheryl! I’m currently struggling with our 2nd loss. We have 4 babies born by emergency cesearesns, 2 during VBAC’s. I’m heartbroken our Abraham isn’t part of our family and I’m downhearted that the Lord may not have more babies for us. Do you have any words of encouragement for me? We have been raising our children up in the Way they should go and I have been homeschooling for 8 years. What a beautiful and encouraging story. Our walk with the Lord can be scary and overwhelming at times but we have the assurance that He is there for us and He knows all and loves you more than you can imagine.